Hello! It's Tuesday so that means it's new sketch time once again at Tuesday Morning Sketches. Let me say this card was a REAL struggle! Seem to be having a lot of those lately. It's not my favorite by any means but it's done! The image has been in my box for ages and I have no clue what it is. I tried adding some sequins and should have stopped there but.....got out a bottle of white enamel and went a little crazy making dots. I like them on the butterfly but not so much in the center of the sequins. Live an learn and better luck next week! LOL Anyway Thanks for stopping by and be sure to stop by and see what the rest of the DT has come up with this week. What I like most about your card is the variation of colors from top to bottom and how things just flow together! 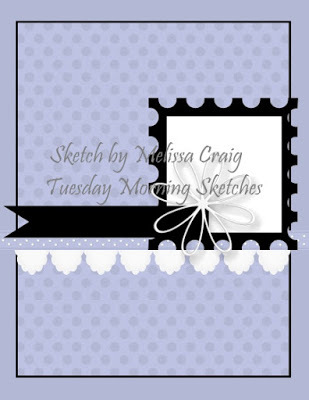 I love the little butterfly and great gingham border with lace! It's a winner!! LoL, the enamel looks fine. I do the same kinds of things and then say "duh". I know we get a bit frustrated at times with the center holes in the sequins. I love the card and the way the colors create a cool sunset feel. This is a really cute and wonderful card! You're too hard on yourself! Janice, this card is every bit of beautiful! Like Carol said above, the colors flow so nicely and that butterfly is the perfect addition and goes so well with the colors! Great card and nice job on the sketch this week! TFS and hope you have a wonderful weekend! The sun is shining!! WooHoo! It may not be your favorite, but it is one of mine. I love the ink colors and white dots are awesome. You're being too hard on yourself.